Full Employee Engagement is Sewer Power, Really! Notice what is in front of you. I was returning home from a jog when I encountered my neighbour and her two sons. The boys, ages 2 and 4, were bounding ahead of their mom straight to the cover of the sewer on our street (see the picture of the actual sewer above). Down the Sewer and Into Engagement. They didn’t hesitate to plunk themselves down on the manhole and engage fully with the sewer. Within moments, I noticed them scrapping at the grate with little twigs, throwing small pebbles to hear the plunk, and lying face down and peering down into the dark abyss. Embrace time. Embrace time in your life to experience the absorption and freedom of full engagement. The myth of inherently engaging work. Work is not engaging in and of itself. With the right mindset we can engage in any type of work. Stop dreaming of another job and wake up to the work in front of you. Work is better together. Engagement is better together. It helps to engage with your younger brother or a coworker. Engagement is doubled: engaged in work and engaged with each other. Get close to your work. Stop being self-conscious while you work, feel free to lay on the sewer without a care or simply immerse yourself in the work in front of you. Stay young, don’t grow up. When someone tells you to grow up don’t forget how engaged you were when you were young. Leverage the wisdom of weaving play into your work. Stinky work? Even stinky work can be engaging. Below the surface. In our work, there is lots going on below the surface. Take time to notice and drop the occasional pebble down the grate to hear how deep your work actually is. Get your mind into the gutter. Perhaps we don’t always have to get our mind out of the gutter. Find tools close at hand. Look for tools and job aids close at hand. A twig can be a scrapper and a pebble can be a depth charge. What tools are at hand that would help you more fully engage in your work? Be Grate! Ask yourself: What is holding me back from “Grate-ness”? Invite your boss to engage. Don’t be afraid to call your mom or boss over to see the neat things you are engaged in. You might just be engaging them too in their work. Adventure is right in front of us. Stop taking so much for granted. We can find adventure in the manhole or the mundane. Remember, even a hole has the potential to create wholeness. “Let be” versus “get do”. Engagement may be as much about letting your self be as getting yourself to do. You learned it all before kindergarten. Perhaps all we needed to learn about employee engagement can be learned before kindergarten. Invitation. You don’t need to race out of your cubicle on the 52 floor of your office building in New York City, race down the elevator, and drop yourself on to the road and peer down a sewer grate on Fifth Avenue. Although if you are so inclined don’t think I would stop you (of course watch out for cars). What I do invite you to do is read the lessons above and determine what you can do to fully enhance your work experiences. David Zinger, M.Ed., is an employee engagement writer, educator, speaker, coach, and consultant. He offers exceptional contributions on employee engagement for leaders, managers, and employees. David founded and moderates the 2300 member Employee Engagement Network. His website offers 1000 posts/articles relating to employee engagement and strength based leadership. David is involved in the application of Enterprise 2.0 approaches to engagement and the precursor, creating engaging approaches to communication, collaboration, and community within Enterprise 2.0. Book David for education, speaking, and coaching on engagement today for 2010. I love this!!! And I really think #14 sums it up quite well – we really had a lot of this stuff down by kindergarten…and then slowly un-learned it as we grew older (and wiser??). Alright, I’m off to explore the adventures that lie right in front of me!! Thanks Lance, it is all down the sewer from here. Kind of my own personal Alice in Blunderland. Engaging work is not a myth but few look for it. Work is better together for those who find it so. Too much effort is spent trying to get employees to be engaged. Employee engagement is what employers get in return for doing all things well. Doing all things well is very hard work for most of us. Thanks for those grate comments and added lessons. We might have to start a brotherhood of the sewer. Or maybe write a new book that parallels Alice in Wonderland’s rabbit hole adventure. Perhaps it could be Bob in Blunderland down the sewer. 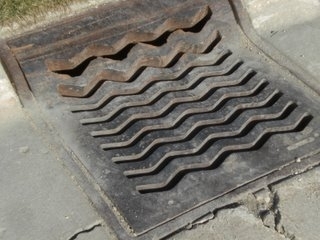 “Grate” post! A couple of years ago, when my niece Alexa was about 2 1/2 years old, I took her for a walk. She stopped at a manhole and threw the requisite pebbles down, listening for the plunk. Then she leaned over and shouted, “Heyyo!” – she couldn’t pronounce her L’s. She then told me to do what she had done. I leaned over and shouted, “HELLO!” Alexa reprimanded me – “Not like that Audrey! Like this – HEYYO!” I also went home and pondered the marvel of a manhole for a child, and I wondered at how we, as adults, lose our sense of wonder. I like how you equated that to the workplace. Happy travels to you and yours! I had to get a new address after switching from Verizon to Comcast, see below.